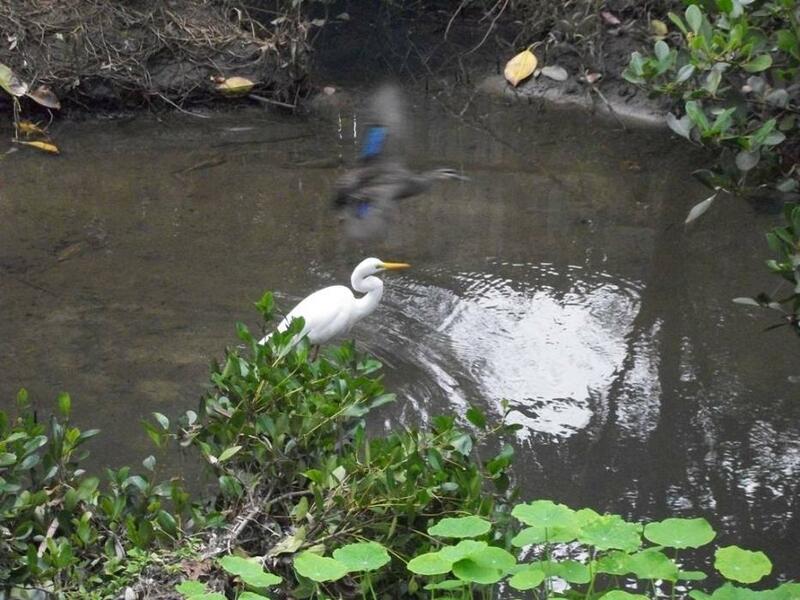 The Great Egret that has been spotted on Careel Creek since 2009 has returned this week and was seen fishing with a White Faced Heron. Some people believe that when these birds return to favoured places it is a sign that pleasant weather is on the way, which Saturday’s pleasant sun and mild winds, after the snow blasts from south earlier in the week, would seem to back up. They waded close to the bank, where small fish shelter, quietly motionless until plunging their beaks in for food. 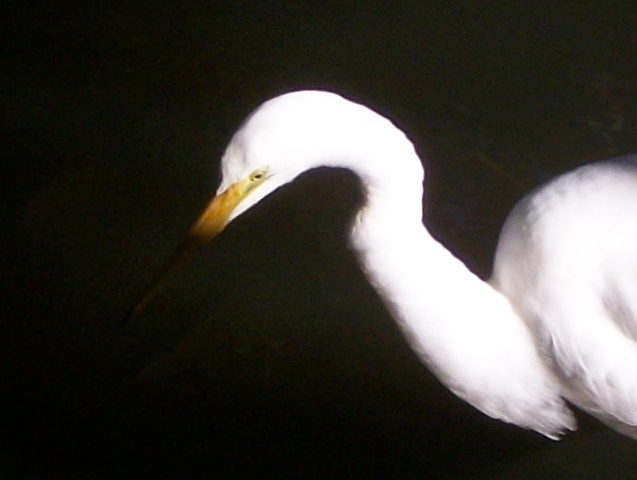 The Great Egret, Ardea alba, prefers shallow flowing waters where it feeds on fish which constitute the bulk of its diet. 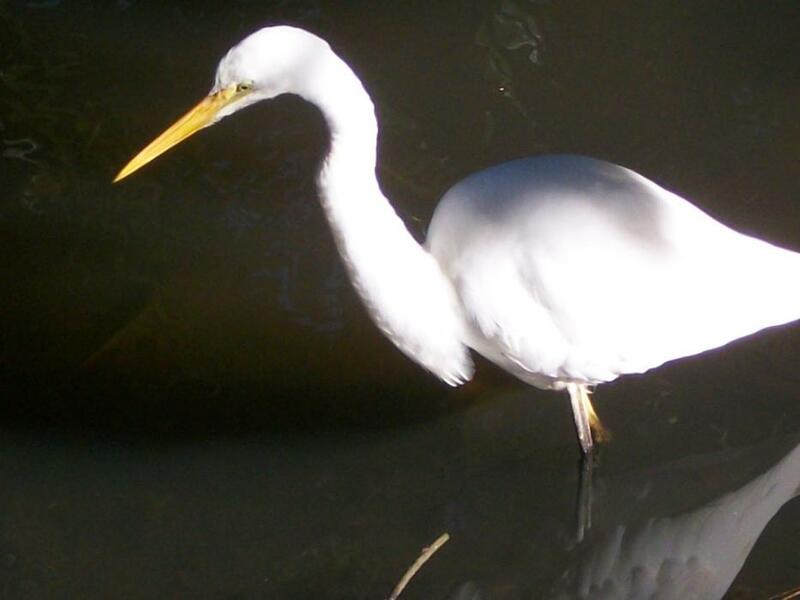 This large pure white bird with a yellow long beak and a neck that is at least one and a half times its body length, inhabits most areas of Australia apart from the arid inland. During the breeding season (October to November) it grows long hair-like feathers (nuptial plumes) along its back. 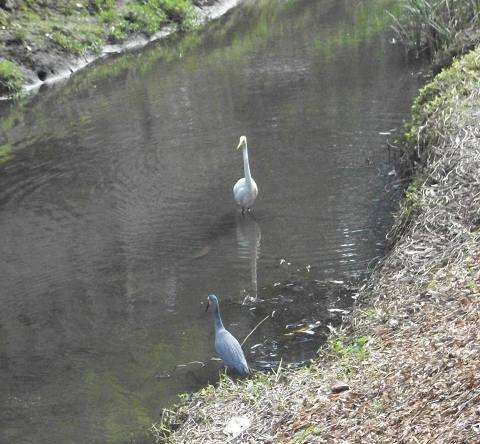 This species, related to the White Faced Heron, Egretta novaehollandiae, quite happily fish together and these two looked quite at home in each other’s company during the week. Clearly they have known each other for a few seasons or have a ‘bird language’ that forms part of Pittwater’s bird community. 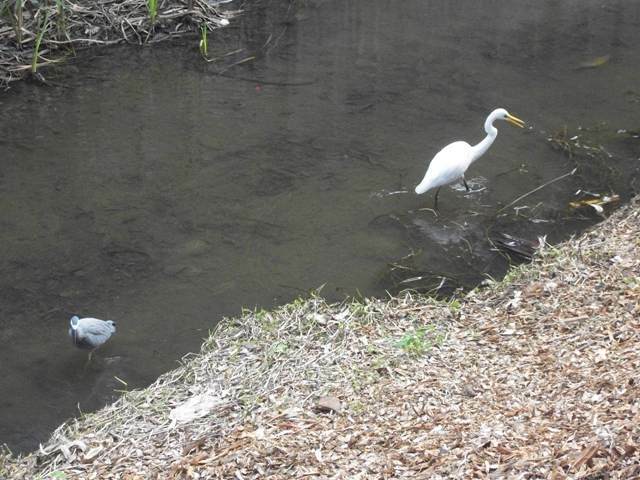 Herons and egrets will also share communal breeding grounds with ibis and cormorant colonies. 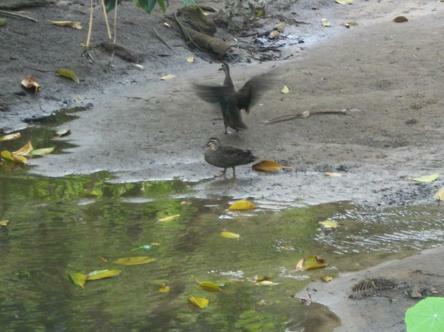 The ducks that inhabit the creek, as witnessed in past years, seem to have a small ongoing feud with this bird. Ducks have been seen swooping over egrets and egrets have been seen ‘herding’ ducks who are quickly shimmying (or paddling) out of their way when trying to pass each other in this lovely stream. This week, perhaps another sign that Spring is on its way, the ducks were making 'wing flapping' displays; usually a warning about territory, and making lower then necessary flights over the larger birds. Copyright A J Guesdon, 2012. All Rights Reserved.